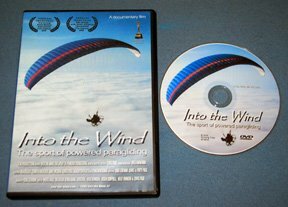 What people are saying about "Into the Wind"
"Just received the DVD, you captured the spirit of "Endless Summer" only in the air!" John Fetz, Lake Havasu, AZ. "Watched ITW this weekend, great job! really enjoyed it." Taylor Cole, Pembrooke Pines, FL. "Makes me want to go out and try powered paragliding!" "Beautiful footage of the great outdoors from a unique perspective." "An adventurous journey into powered paragliding with a backdrop of some truly picturesque places of the southwest U.S. and Mexico." Alex Hentelhoff, Santa Barbara, CA. "I can't wait to come and fly in America."